Wilson Logistics Offers Both Company & Lease Opportunities For Teams In The Alabaster, AL Area! Jim Palmer offers both company and lease opportunities for teams interested in over the road driving. While we primarily run solos trucks, we do have a decent percentage of team trucks in our fleets. Every fleet manager has experience running teams. 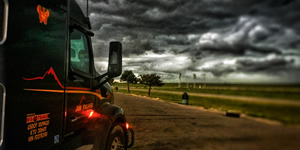 We have the freight and the miles to keep you moving! We offer 44¢ per mile to our team drivers. PLUS! We offer our fuel incentive program on team trucks, which can add up to an extra 5¢ per mile per load extra! Team drivers earn a day off for every week they spend out over the road. We typically expect drivers to stay out for four weeks or more. For team lease driving opportunities with Jim Palmer, please call us for more details. We highly recommend this opportunity for experienced teams that have driven together, but we would love to talk to you about the program. NO DUI/DWI convictions in the last 5 years. NO drug convictions in the last 5 years.